January 20th, 2007 Yesterday, we took a trip out to a rural village school in Morelia located at the base of Vulcan Fuego (Fire Volcano). We found out a little more of what the organization we’ll be volunteering for is all about. For the trip a bunch of us crammed into the ‘bibliobus’ (library bus) full of books, reading, and other useful materials along with a ton of new desks strapped down to the roof. The desks were a finishing touch to a project Probigua, in conjunction with a Switzerland based sponsor, started over one year ago. They raised enough money to build a new school section in the small village, provide it with white boards, lights, and desks. 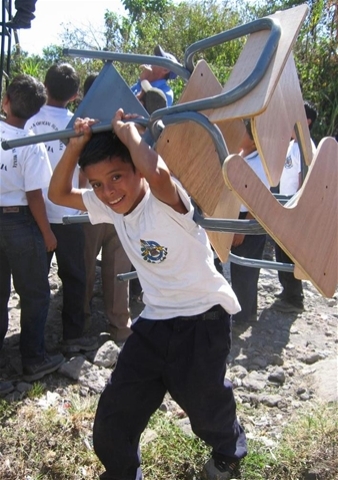 There were prolly 150-200 kids going to school there that all greeted us with big smiles and giggles, and the boys quickly jumped in to help carry the new desks. 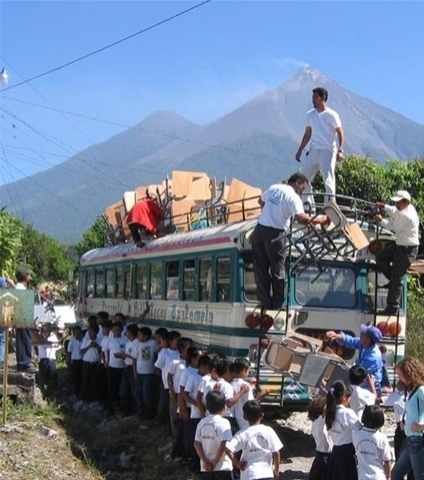 After everything was unloaded an assembly took place to thank Rigoberto, the Probigua founder and visionary, and Max from the Switzerland sponsor. Then they fed us all food and played live music. The kids were somewhat timid and drawn to us who had cameras in our hand. They would all pose for a picture, someone would take it, and then they’d want to see it immediately, and then the process would repeat over and over if allowed. The village was very grateful and appreciative of the support. One father even took a day off work from the sugar cane fields to personally thank Probigua for all the help in front of the large crowd that had gathered. At night Rachel and I met up with some other students from the school for some drinks. There is one lady from Oregon, others from Germany, Denmark, Canada, Switzerland, and Austria. Everyone seems nice, but we still feel on the ‘outside’ of things at this point. This will probably change though once we begin class on Monday and volunteering shortly thereafter.